Several chemicals are essential to life and follow predictable cycles through nature. In these natural cycles, or biogeochemical cycles, the chemicals are converted from one form to another as they progress through the environment. The water/wastewater operator should be aware of the cycles dealing with nutrients (i.e., carbon, nitrogen, and sulfur) because they have a major impact on the performance of the plant and may require changes in operation at various times of the year to keep them functioning properly; this is especially the case in wastewater treatment. 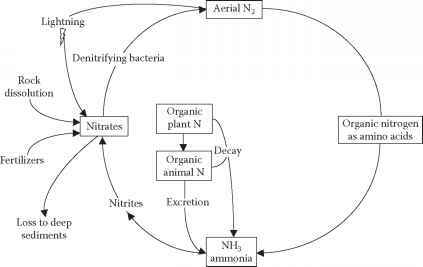 The microbiology of each cycle deals with the biotransformation and subsequent biological removal of these nutrients in wastewater treatment plants. Note: Smith (1974) categorized biogeochemical cycles into two types: gaseous and sedimentary. Gaseous cycles include the carbon and nitrogen cycles; the main sinks of nutrients in the gaseous cycle are the atmosphere and the ocean. Sedimentary cycles include the sulfur cycle; the main sinks for sedimentary cycles are the soil and rocks of the Earth's crust. Carbon, which is an essential ingredient of all living things, is the basic building block of the large organic molecules necessary for life. Carbon is cycled into food chains from the atmosphere, as shown in Figure 8.17. From Figure 8.17, it can be seen that green plants obtain carbon dioxide (CO2) from the air and, through photosynthesis, which was described by Asimov (1989) as the "most important chemical process on Earth," it produces the food and oxygen that all organisms require. Part of the carbon produced remains in living matter; the other part is released as CO2 in cellular respiration. The carbon dioxide released by cellular respiration in all living organisms is returned to the atmosphere (Miller, 1988). Some carbon is contained in buried, dead animal and plant materials. Much of these buried animal and plant materials were transformed into fossil fuels. 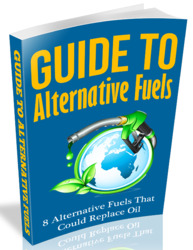 Fossil fuels—coal, oil, and natural gas—contain large amounts of carbon. When fossil fuels are burned, stored carbon combines with oxygen in the air to form carbon dioxide, which enters the atmosphere. In the atmosphere, carbon dioxide acts as a beneficial heat screen, as it does not allow the Earth's heat to radiate into space. This balance is important. The problem is that, as more carbon dioxide from burning is released into the atmosphere, the balance can and is being altered. Odum (1983) warned that increases in the consumption of fossil fuels "coupled with the decrease in 'removal capacity' of the green belt is beginning to exceed the delicate balance." Massive releases of carbon dioxide into the atmosphere tend to increase the possibility of global warming. The consequences of global warming "would be catastrophic ... and the resulting climatic change would be irreversible" (Abrahamson, 1988). How does sewage from our homes affect the biogeochemical cycke?